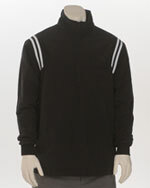 Pullover - Matching Rib Collar and Cuffs - Weather Resistant Coated Shell - Fully Lined - Side Seam Pockets. Open Bottom. Black with Black/White Trim Only.